Cam's social calendar was pretty busy this week! Neighbor and good friend, Patti, stopped by on Monday to spend some time with Jane & Cameron. He was showing off his cool airplane, showing her how the door opened and closed and how all the people worked. 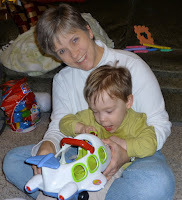 After Grandma's visit, the big boy had quite the hair cut with friend, Mandy. This was the first time she had to use the clippers on Cam since his hair has really grown so fast. He wasn't too sure about the whole thing, but after it was all over, he enjoyed a tasty sucker. With the beautiful weather still holding, Chris & Jane took Cameron over to Cascade Park where they enjoyed some time on the swings and the slides. The family is hoping there still may be another park trip yet! Cameron has to walk every day in his walker and he's still getting used to those leg braces. Annie, Chris, Jane & Grandma work with him to help the big boy through this transition. For some added exercise, Chris took Cam on the treadmill and the boy really seemed to like it!